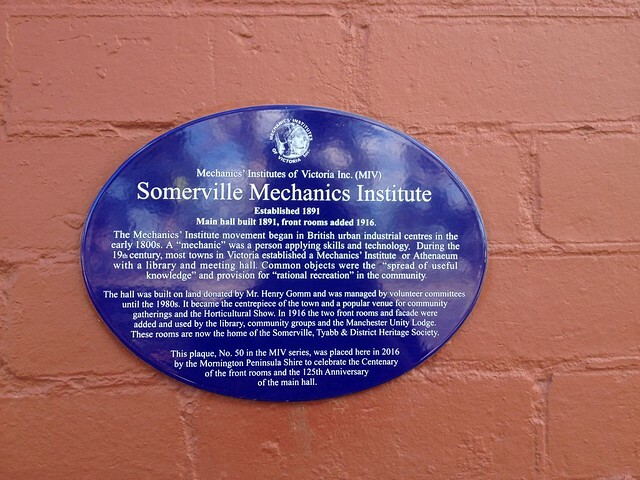 Somerville Mechanics' Institute. Established 1891. Main hall built 1891, front rooms added 1916. The Mechanics' Institute movement began in British urban industrial centres in the early 1800s. A "mechanic" was a person applying skills and technology. During the 19th century, most towns in Victoria established a Mechanics' Institute or Athenaeum with a library and meeting hall. Common objects were the "spread of useful knowledge" and provision for "rational recreation" in the community. The hall was built on land donated by Mr. Henry Gomm and was managed by volunteer committees until the 1980s. It became the centrepiece of the town and a popular venue for community gatherings and the Horticultural Show. In 1916 the two front rooms and facade were added and used by the library, community groups and the Manchester Unity Lodge. These rooms are now the home of the Somerville, Tyabb & District Heritage Society. This plaque, No. 50 in the MIV series, was placed here in 2016 by the Mornington Peninsula Shire to celebrate the Centenary of the front rooms and the 125th Anniversary of the main hall.